Wood construction offers economic, performance and environmental advantages not typically found with other structural materials. Wood is cost effective, versatile and adaptable. It’s renewable and has a light carbon footprint. It also has a proven record for safety, evidenced by its use not only in 90 percent of all U.S. home construction but in some of today’s most innovative non-residential architecture. In terms of fire protection, building codes require all buildings to perform to the same level of safety regardless of materials. Wood buildings can be designed to meet rigorous standards for performance, which is why the International Building Code (IBC) allows the use of wood in a wide range of building types—including structures that are taller and have more area than some designers realize. This CEU provides an overview of fire protection in wood buildings with a focus on compliance with the 2015 IBC, and is based on the Code Conforming Wood Design Series developed by the American Wood Council (AWC) and the International Code Council. Building fire safety incorporates a combination of passive and active features. A passive fire safety feature may limit the height and area of the building, prescribe the use of fire-rated building elements or provide for adequate means of egress. Active fire safety features are those such as automatic fire detection or suppression systems that provide occupant notification, alarm transmittance and the ability to suppress fire growth until the fire service arrives. Codes are relying increasingly on active systems, since, with proper maintenance and alarm supervision, they have a high degree of reliability. This CEU covers the fundamentals of passive and active fire protection. It includes a summary of allowable wood use in buildings in accordance with the 2015 IBC, emphasizing the design flexibilities permitted for wood in non-residential and multifamily construction. While most people are familiar with the basics of an active fire suppression system, including the use of sprinklers, fire extinguishers, etc., passive fire protection is what actually contains a fire at its point of origin. Passive fire protection, despite its name, is always at work. Components and systems are intended to contain fires or slow the spread of fires through the use of fire-resistant building elements such as fire-resistant floors and walls, and open space. Occupancy classification or use of a building plays a key role in the organization and prescription of appropriate fire protection measures. Throughout the IBC, occupancy group classifications are fundamental in determining the necessary features of construction and occupant safety, including limitations to building geometry, means of egress, fire protection and interior finishes. For example, regulation of the size of structures is based on specific hazards associated with the occupancy as well as the characteristics of construction materials used. The allowable area of a building is now determined in accordance with the applicable provisions of Sections 506.2.1 through 506.2.4 and Section 506.3. However, the values determined by these sections can be increased through the presence of passive and active fire protection systems. 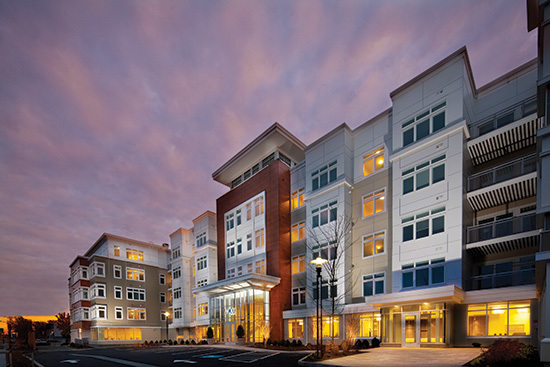 Vox on Two in Cambridge, Massachusetts, includes four stories of wood-frame construction over a concrete podium. The IBC was introduced in 2000, consolidating three regional model building codes into one uniform code that has since been adopted by most jurisdictions. This consolidation increased the possibilities for wood construction by recognizing fire protection systems and techniques that had a demonstrated history of fire safety in one of the legacy codes. Subsequent versions of the IBC have expanded the opportunities for wood use even further through the application of additional state-of-the-art fire protection features. The IBC is intended to protect public health, safety and general welfare as related to the construction and occupancy of buildings and structures. To this end, it requires all building systems to perform to the same level of safety regardless of the building material used.